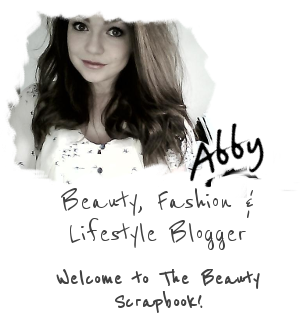 The Beauty Scrapbook: What's in my bag? Happy Monday to all of you darlings out there! Today I thought I'd give you a little sneak peak into my life and see what I carry around with me on a daily basis pretty much. I work full-time throughout the week so my bag always need to be packed full of the essentials! My chosen bag of the week is my Fiorelli tan side bag which is perfect for popping the necessities in and it's very cute. The only issue I have with it is that the fastening of it can be a bit of a nuisance, but I think it's totally worth it. Fiorelli Purse - Do you see a theme yet? I love me some Fiorelli, they produce good quality leather goods yet the price doesn't sting. I love a purse with a lot of space for cards and coins. Easy access is also helpful as well! The design of this purse is very simple but I like that about it. Unfortunately, the silver paint has started to wear off the badge on the front so it's looking a bit worse for wear even though I've only had it a matter of months. Windproof Umbrella - My parents gave this to me for Christmas and it has been amazing! I basically repel umbrellas, they always blow inside out and the spokes end up damaged. This one, however, is yet to blow inside out (fingers crossed). It is also water resistant so the water just rolls off and it doesn't stay wet for long. It also comes with a torch on the bottom which is also useful but I have yet to use it properly myself. You can also pick it up from QVC in different colours as well. Hand Cream - My hand cream of the moment, and probably the last year, is the Soap & Glory Hand Food. I love this stuff, it smells great and it really moisturises my hands without leaving them feeling greasy as it absorbs really well. Hand Sanitiser - I am slightly religious with my hand sanitiser, I could not go anywhere without it! At the moment I'm using the Carex Hand Gel Moisture Plus as it doesn't dry out my hands like most hand sanitisers and it dries extremely quickly. Notebook & Pen - I often have the occasional thought that needs writing down, this is where the magic happens. The notebook is from Sainsbury's and the pen is from Paperchase. I especially love the handwriting pen! Gloves - Since we live in a permanent confusion of what the weather is going to be like, I like to make sure that I am prepared. These gloves were a gift last Christmas and I mainly have them handy in my bag as I am able to use my phone with them. Brush & Comb - Pretty self explanatory really, who knows when it's going to be a windy day? Thanks for reading! 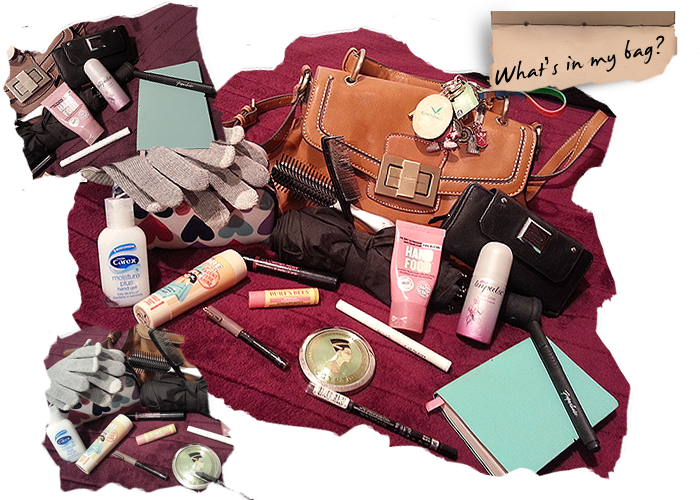 What essentials do you simply have to have in your bag? Windproof umbrellas are the bomb. I have one and it has saved my life during windy and rainy days. They really are, everyone should have one! Great! I always have to keep hand crème and hand sanitizer in my bag. Lovely post! I love seeing what people have in their bags, love your bag! Oh what Big Eyes you have Maybelline..